DIY Computer Gesture Control via Webcam and Arduino « Adafruit Industries – Makers, hackers, artists, designers and engineers! While touchscreens are nice, wouldn’t it be even better if you could simply wave your hand to your computer to get it to do what you want? 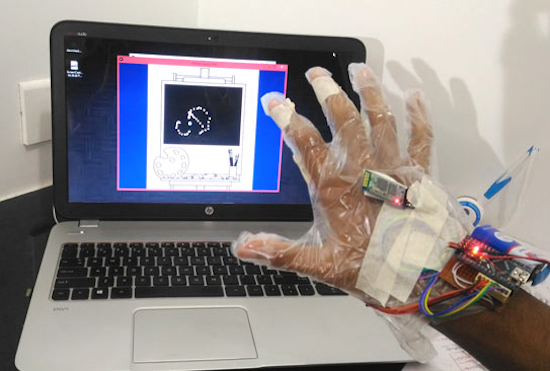 That’s the idea behind this Iron Man-inspired gesture control device by B. Aswinth Raj. 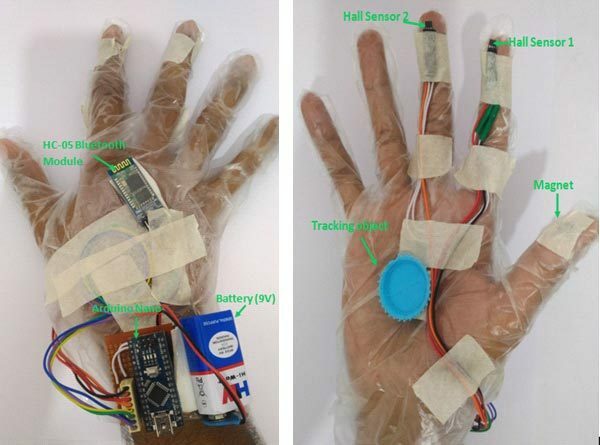 The DIY system uses an Arduino Nano mounted to a disposable glove, along with hall effect sensors, a magnet attached to the thumb, and a Bluetooth module. This smart glove uses the finger-mounted sensors as left and right mouse buttons, and has a blue circle in the middle of the palm that the computer can track via a webcam and a Processing sketch to generate a cursor position.